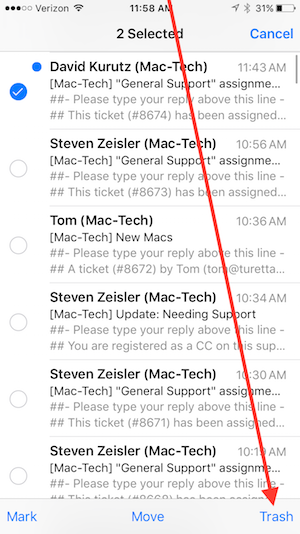 After tapping the “edit” button and with no messages selected, the “Trash All” button is displayed in the bottom right hand corner of the Mail Application. If you were to tap “Trash All” right now, it would delete every message in this folder. 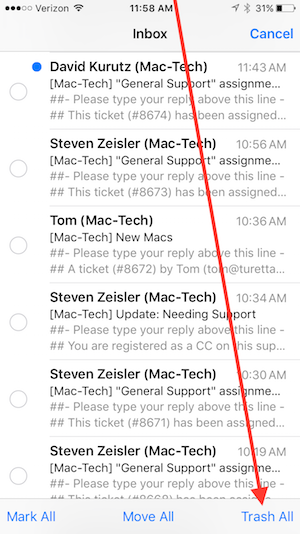 The “Trash All” button is only visible when no messages are selected, lets take a look at what happens after a message is selected in the edit menu. Once a message (or messages) is selected, the Edit menu changes and “Trash All” is replaced with the traditional “Trash” button. Tapping the “Trash” button right now would only delete the one selected message, if there were additional messages selected, they would also be deleted. Bear in mind that the “Archive All” and “Trash All” buttons are only displayed when the edit menu has been opened and no messages have been selected. Q: What should I do if I’ve accidentally used the “trash all” feature? A: There is not an elegant way of undoing the “Trash All” command. The best solution is to go to trash in the affected account, select the messages which were deleted and move them back into the inbox. 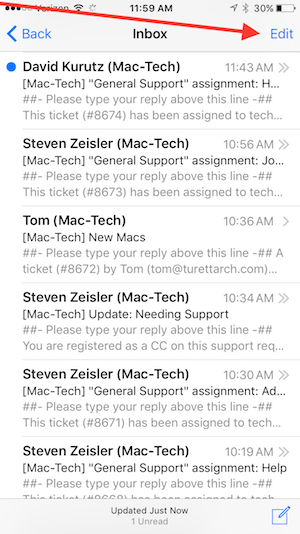 In an instance where thousands of email messages have been deleted, open the trash, select all the messages in the trash and move them back into the inbox.